Developing WordPress eCommerce sites can be time-consuming. The time spent uploading products might not give you enough time to design the website itself. The easiest and fastest way to create an eCommerce site with Divi is to use a pre-made child theme. “Pre-made child themes provide layouts for landing pages, various home pages, about us pages, various layouts for blogs, multiple types of galleries, pages for your store, and more–all pre-designed for you so you can spend your time on something else. Many even provide login customizations, footer editors, 404 pages, demo content to help you get started quickly, as well as styling and add-ons for the #1 eCommerce solution for WordPress – WooCommerce. Although you can use several plugins and solutions for eCommerce, the best Divi eCommerce child themes are those that are integrated with WooCommerce. WooCommerce uses clean code with great features and a nice interface. The Divi Builder contains several modules that work perfectly with WooCommerce including the shop module and the ability to add shortcodes within text modules. Let’s take a look at my picks for the 10 best Divi eCommerce child themes. Stick around to the end and you’ll see a bonus plugin that will make your WooCommerce pages even better. Here are the 10 child themes in no particular order. 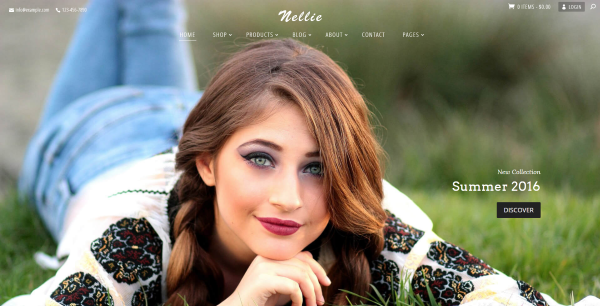 Nellie is an eCommerce Divi child theme from Ayanize Co. Nellie was specifically made for WooCommerce and includes lots of WooCommerce customizations. Many custom pages are included as well as two new modules, a footer builder plugin, AC Shortcodes plugin, CSS editor, a 404 page, custom login page, header customizations, and demo content. You can even use a Google Map as a background.